Jim Harvey hailed a “magnificent” result after FC Halifax Town beat Macclesfield 1-0 to move out of the National League relegation zone. Shaun Tuton’s second-half winner was enough to seal Town’s sixth win in nine games under Harvey against a Macclesfield team that could have gone third in the table had they won. Halifax were the better side at Moss Rose, and Harvey was delighted by his team’s performance. “That was terrific. It’s becoming repetitive now with the performances, which have been excellent,” he said. “We knew this was going to be a tough game. Macclesfield have been playing well, winning matches recently and they’re a footballing side. 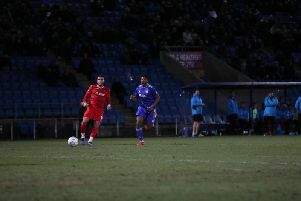 Harvey said The Shaymen should have been ahead before half-time and praised his players’ attitude after another impressive performance. He said: “If we’d come in two or three up at half-time it would have been a true reflection of our dominance. That didn’t happen. “Then you’ve seen in the past where you’ve had so much dominance and opportunities and all of a sudden the opposition break away and you get beat 1-0. “That did cross my mind but at the moment we’ve just got the bit between our teeth. “The boys are terrific - their attitude and their commitment for one another is first class and thankfully we’re getting the results to go along with that, because it’s not always the case you get what you deserve. Harvey was impressed by the manner of Town’s winning goal. “Shaun will take the credit for scoring but the approach play was excellent,” said the Town boss. “I don’t know how many passes we had in the build up but Jordan Burrow has travelled with it, he was patient in possession and then he’s flicked it into Kingsley, who did extremely well with the control and pass to Shaun. Harvey also praised his defence, who kept their third clean sheet in four games. “Sam (Johnson) has had very little to do. One or two easier saves that we’d expect him to make but nothing too troublesome,” reflected Harvey. “Defensively they did really well. Matty Brown and Hamza and Bolts in particular, those three maybe don’t get an awful lot of credit, but that’s the bedrock of our team, being solid defensively and not conceding an awful lot. “If you think back to the goals we’ve conceded this year, it’s a hell of a transformation. hoping to extend captain Nicky Wroe’s loan until the end of the season, said his squad are much more positive group than the one he inherited. “You can see the confidence is right up at the moment,” he said. “The training sessions have changed, the atmosphere has changed totally and all of these goals we’re achieving, getting out of the bottom four particularly, is a massive one. “That’s going to give everyone a boost.